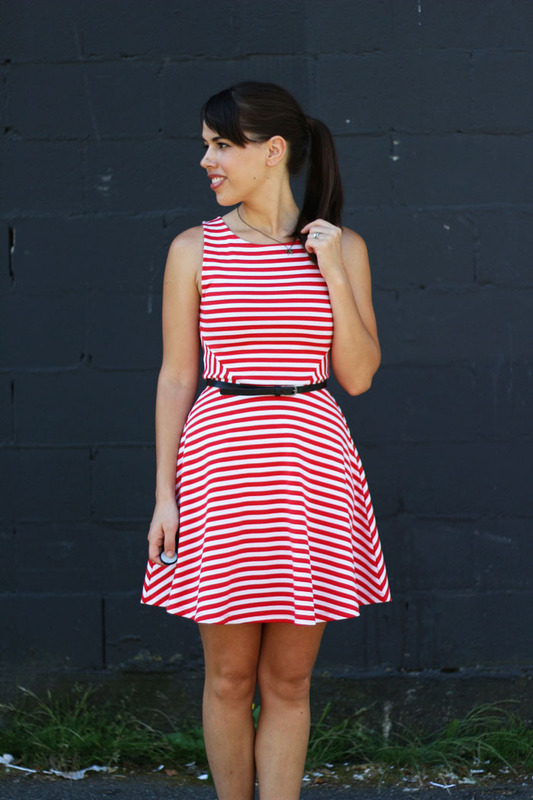 July 1 - Peppermint Fit and Flare Dress + Happy Canada Day! Hey everyone, Happy Canada Day! 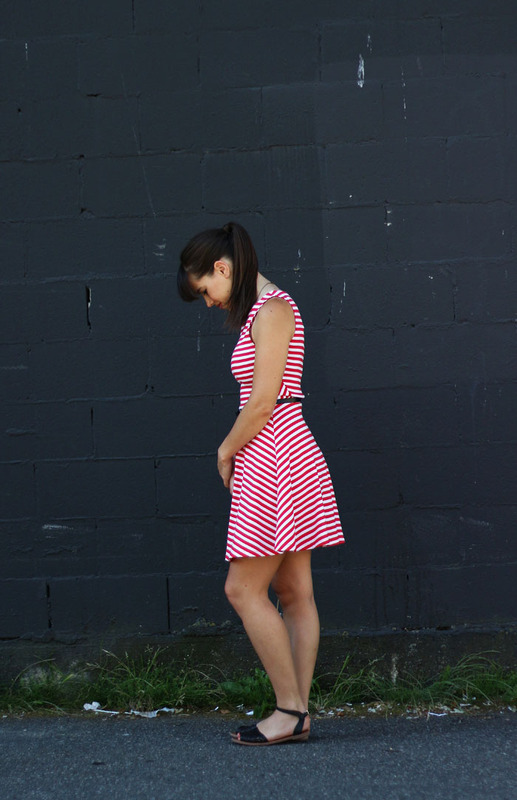 I've had this darling little H&M dress for at least a year now (it's amazing looking back through my archives and seeing how long I've had certain items for!) and I just love it. It's from the Divided line and is a cotton/spandex blend, so I don't expect it to last forever, but it's doing really well so far. 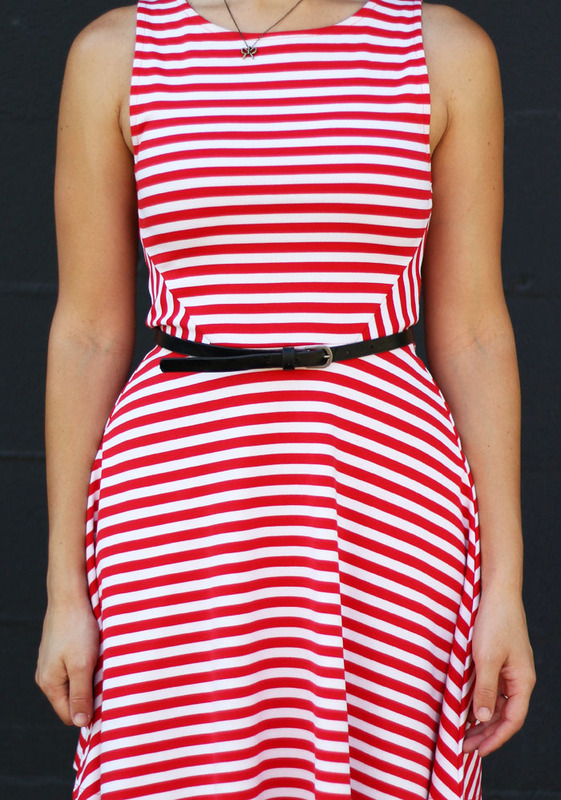 I don't see it in red and white online, so I linked to a blue one (which is on sale for 15! ), but I did see this red one in stores about 2 weeks ago. 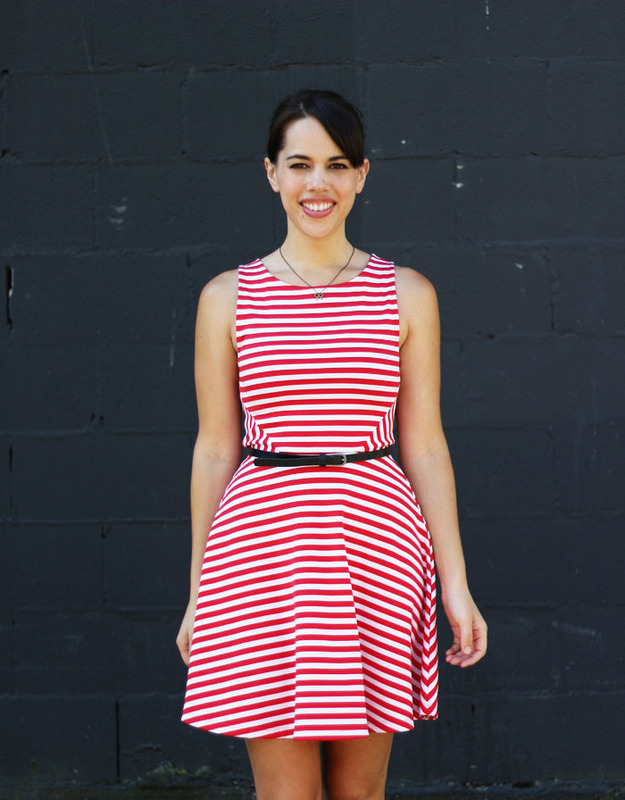 It's nice and fitted in the bodice and gently flares out just below my natural waist - the definition of fit & flare. These black leather (yes, real leather) sandals are a new purchase from Gap. They retail for $54.95 but I was able to get them during one of their 40% of sales online. Buying shoes is tough for me. I really prefer to buy in person so that I can try them on first, since sizing can vary so much depending on the brand and type of shoe. But, in stores like Gap where shoes are not their main product, often there aren't many sizes to choose from. I also find that shoes are often discounted in-store and only come on sale online during specialty sales (ie, they are often excluded from the online sales coupons I receive via email). I know that with many stores I can just order and return shoes for free, but its such a hassle - I hate waiting! Speaking of, I recently ordered two pairs of shoes from J.Crew Factory during one of their 40 or 50% off sales. These metallic flats have been on my wishlist for a good couple of months but I hesitated on pulling the trigger due to my concerns above. And, shopping at J.Crew Factory from Canada, shipping is not free, nor are returns :( (in this case, there was a promo that included free shipping) But, once I saw these pop up, I felt like I had good reason to place an order. I've needed replacement leopard flats for my Banana Republic Factory ones (last seen here) for about a year now (ok, maybe 6 months) and these seemed pretty perfect - pony hair & pointy toe were my two main "musts", but the colour-blocking of the heel is an added bonus. Canada Day / Independence Day often means huge sales so if you still have items on your summer wishlist, now would be a good time to scoop them up! Happy shopping and I hope you all enjoy your long weekend!